U.S. Variable Frequency Drive Industry « Global Market Insights, Inc. The U.S. variable frequency drive (VFD) market is projected to consolidate itself into an extremely lucrative investment avenue over the forthcoming years owing to the growing environmental concerns. Additionally, apart from receiving a sizable boost from the environmental preservation activities, the introduction of numerous standards & directives by local governments pertaining to the issue of utilizing energy in a more efficient manner is also expected to turn the U.S. marketplace into an avenue that would be immensely conducive for the overall growth of the nation’s VFD market. Moreover, rising industrialization and the ongoing urbanization trends would also be augmenting the industry landscape. Furthermore, several technological enhancements coupled with increasing energy optimization demands across the nation’s electrical components, while promoting the adoption of micro power drives, have been responsible for fueling U.S. VFD market. These units facilitate precise control over the speed & torque with compact size, limited maintenance & high efficiency, which effectively eliminates the hesitancy factor that previously prevented OEMs from adopting VFDs for their electric systems. The U.S. shale industry has been experiencing a significant surge in production rates in recent years. In fact, a 2018 report by Forbes highlights an ongoing trend where the U.S. Energy Information Administration (EIA) has been continually increasing its 2019 natural gas production projection. In September of 2018, the EIA’s National Energy Modeling System upped its 2019 shale gas production forecast by more than 6.3% or 5.3 Bcf/d. The rig count in 2018 across the U.S. was pegged at approximately 198 with natural gas production at approximately 87 Bcf/d. This increasing production rate is slated to be extremely beneficial for the U.S. VFD market owing to the ongoing modernization of the natural gas industry wherein the gas-assisted glycol pumps, that are extensively used across the industry, are being replaced by electric pumps. According to the U.S. Environmental Protection Agency, gas-assisted circulation pumps are the most commonly used pumps across the industry. However, in an effort to improve their operating efficiencies & reduce their emissions in a significant manner, enterprises are replacing their gas-assisted circulation pumps with electric pumps, which owing to their efficient VFD-powered operations, could save the operator more than $21,000 worth of gas on a yearly basis, thereby driving the U.S. VFD industry expansion. U.S. VFD market | Impact of increasing electric vehicle sales across the U.S.
Owing to innovative technological advancements, electric vehicle (EV) sales have been witnessing a sharp upward trend in recent years. This increased demand, while driving electric vehicle production, has also been responsible for fueling the regional VFD market growth. The technological advancements have successfully turned EVs from a concept & novelty product to a serious contender that would be giving serious competition to the conventional internal combustion engine (ICE) powered vehicles. According to a 2018 report by Edison Electric Institute (EEI), in the years between 2011 & 2018, the number of EVs running on roads across the U.S. has gone from zero to approximately 890,000. In the first two quarters of 2018, approximately 124,000 EVs were sold across the U.S. alone, up by about 40% when compared to the 2017 numbers. While environmental factors & cheaper operating costs were initially responsible for driving industry demands, according to a report by the Union of Concerned Scientists, much of the recent increase in sales is being chalked up to the launch of new models with Tesla leading the charge with the launch of the Model 3, which notched more than 22,000 vehicle registrations in the first two quarters of 2018. Owing to the presence of industry leaders such as Tesla and Ford, the region’s EV market has been rapidly expanding, a fact that is slated to drive the U.S. VFD market to new heights over 2019-2025. Attributing to these aforementioned trends, it is overtly clear that the U.S. VFD market has primed itself to attract exponential amount of growth over the coming years. The projection is further supported by a recent research report by Global Market Insights, Inc., which expects the U.S. VFD market to surpass the $3 billion renumeration mark by 2025. This entry was posted in ENERGY, MINING, OIL AND GAS and tagged U.S. Variable Frequency Drive Industry, U.S. Variable Frequency Drive Market, U.S. Variable Frequency Drive Market Analysis, U.S. Variable Frequency Drive Market Growth, U.S. Variable Frequency Drive Market Outlook, U.S. Variable Frequency Drive Market Pdf, U.S. Variable Frequency Drive Market Price, U.S. Variable Frequency Drive Market Report, U.S. Variable Frequency Drive Market Share, U.S. 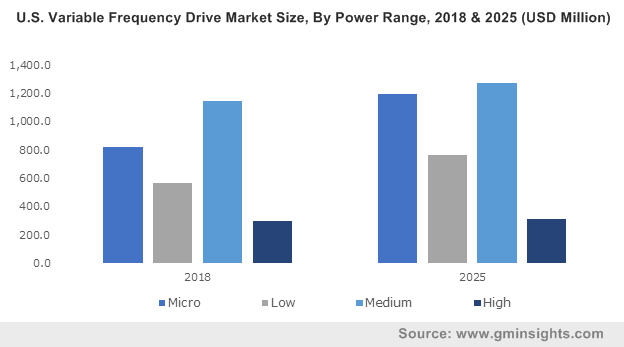 Variable Frequency Drive Market Size, U.S. Variable Frequency Drive Market Trends.